Cozy Lakefront Chalet w/ Hot Tub, Gameroom & Outdoor Fire Pit! TwinBridge is a beautiful & cozy lakefront chalet-style house in the Poconos with high ceilings, spacious living area with Air Conditioning, a Fireplace, full kitchen w/ large dining table, excellent lake views from all rooms except one bedroom. Outside deck, Jacuzzi, Gas grill, picnic area with a fire pit for roasting marshmallows. Downstairs has 3 Bedrooms (King, Queen, Double and Single) and a full bath as well as a washer/dryer. In home entertainment offers Cable/DVD/VCR and free Wi-Fi/ Internet Access. There is also a game room with Foosball, Air Hockey, Darts, Basketball and Skee Ball. As for the fall, it is a beautiful time of year with the fall foliage all around the lake. Or take a hike in the nearby Hickory Run State Park. One trail even has a waterfall! For the Winter months, we are only minutes from 4 major Ski areas (Jack Frost, Big Boulder, Camelback and Blue Mountain). Or look in our Adventure basket for Shopping, Wineries, Casino, Paintball, Water rafting and other fun excursions nearby. We also have a Restaurant basket with menu's for great places to eat. This 3 Bedroom Chalet is just what you are looking for. It has AirConditioning, a Hot Tub right outside sliders on the lower floor from two of the Bedrooms. Beautiful views of the Lake. The Kitchen is fully equipped with dishes, glassware. Pots & Pans, Utensils, serving dishes etc. Everything you need to cook and entertain. It has a Game Room with Skee Ball, Electric Dart Board, Foos Ball, Air Hockey, and a Basketball game.. The Hot Tub and Picnic Table in a secluded area that also has a Fire Pit to roast marshmallows. House has everything you need for entertainment-DVD/VCR/CD/Cable TV, Free Wireless Internet, gas grill, fireplace and fire pit--Wood included!!!! Take a quiet nap in the Hammock or Play Badminton or have family game night at the big kitchen table with the games & Puzzles provided in the Hutch. A Playground, basketball court and a ball field are all nearby within walking distance. Come relax by the fire, release your stress in the Hot Tub and enjoy time with family & friends. It doesn't get any better than this! Full Bath Downstairs near bedrooms. Half Bath upstairs off Living Room and Kitchen. Also has an outside shower. Row boat included. Lake has only Non-power/Kayak boats allowed. Electric heat with thermostats in each room. We have an indoor wood fireplace as well as an outdoor fire pit. Wood is included!!!! Has reclining couch and love seat as well as a recliner chair. End tables and a fire place all in the family room. Yes we have a dishwasher and we supply the detergent! Mr Coffee maker. We have sweetners and filters in the cabinet above. Yes the basic herbs and spices are there for your use. Kitchen has all utensils for cooking and dishes for a family of 8. Big TV in Family room with smaller flat screens in each bedroom. VCR/DVD Player with lots of movies stored below in the cabinet for your viewing pleasure. Plenty of board games located in the kitchen hutch. The deck is a balcony style with outdoor furniture and great views of the lake. Deck right outside the family room with great views of the lake. Sit on the outside patio furniture and hear the birds chirp while sipping your coffee and looking at the lake. 9 hole Indian Mountain is only 5 minutes away or try HideAway Hills and Jack Frost 18 hole courses nearby. There is absolutely No Smoking and No Pets. Paryies/Events not allowed. We had a really nice time. The restaurants and attractions, outlets/snow tubing are approx. 20-30 min drives, but that was ok. The house has everything needed and the hot tub was a big plus! Everything was very clean. Thank you for having us. Super clean, comfortable & relaxing! My boyfriend and I stayed here for our anniversary and loved it. We had fun relaxing in the hot tub, sitting by the fire pit, playing games, and cooking out. The entire house was very clean which is very important to me. We were a little disappointed about the lake size but it turned out to be ok! We took a little walk around the lake and watched a huge snapping turtle come out of the water which was pretty cool. We were only an hour or so from Bushkill falls so we ventured there one day and went to the country junction afterwards. Overall, we had a great stay. The place is also great for families as it has a playground within walking distance. Thanks again Billy & Mary Jo! Your house is beautiful! Amazing time at an amazing home. Loved everything about this property will definitely be coming back. I highly recommend this rental. You will not regret it. We are so happy you love the house as much as we do! We would love to have you come stay at our property again. Beautiful, fun, relaxing Lake House! I was very happy with Bill and Mary Jo's lake house. The house and property looked to be a nice size online, but I was surprised how much space we had in person. The house was in perfect, clean condition when we arrived and the living room/kitchen/dining room had a great open floor plan, the outdoor deck was a nice size with an outdoor patio set and a picnic table downstairs in the yard for eating after bbq-ing. The hot tub was the main attraction of our weekend, and the sliding doors walking out to the hot tub in two of the bedrooms was a very convenient feature. The fire pit was our favorite evening activity as well; great for roasting marshmallows! The lake was a nice view and we enjoyed walking around it, but it was too mucky for swimming and a few attempts at fishing proved unsuccessful. The only initial disappointment was the game room; the pool/ping pong table was child sized and the fooseball table could use some fixing. We quickly forgot about that, however, since all of the other amenities made up for it. We did bring our own board games and cards, only to discover they had great options to choose from in the house already also. We didn't ventured off the property much, but one day we went on a walk through the woods on an adjacent block and found a stream that we hiked around for a few hours. The house was also a quick 20 minute drive to Barley Creek Brew Company-our favorite restaurant near Camelback. I would definitely recommend this house to anyone looking for a relaxing weekend in the woods; I could see this house appealing to people of all ages. Thanks for a great weekend! When looking to rent again in the future we would love to come back! We are happy you enjoyed our house. We love sharing it with others so they can enjoy the beauty and serenity of the house and location. We do list on the description that the Pool/Ping pong table is a child size and we will look into the foosball table to see what needs fixing. But we are happy you were able to enjoy the other many amenities of the house. Our favorite is the fire pit, it is a nice time with our family sitting out there roasting marshmallows and telling stories. We would love to have you come back and visit again. The winter months are also beautiful with the snow on the ground and we are only 15-20 minutes away from 4 skiing/tubing locations. Camelback is the one 20 minutes away. So we will be looking forward to hearing from you again soon to come back to our Lakehouse! Mary Jo and Billy have a great place in the Pocono's The week we stayed was very hot even for the Pocono's. However we were very comfortable. My wife especially liked the bird that was nested in the flower bed on the deck and the chip monks that would eat some of the bird seed we provided. Sitting out on the deck on the mornings with our coffee was one of the best parts of our stay. My wife and I have rented through VRBO many many times and we found Mary Jo and Billy's place to be one of the best we have stayed at. . Highly recommended. This truly is one of the most beautiful places we've ever rented. The house was clean and roomy. The setting is remarkably peaceful. We loved the area so much that we are considering looking for property there. Great vacation! All year round attractions Winter, Spring, Summer, or Fall: Skiing at Big Boulder, Jack Frost, Camelback, Blue Mt all approx. 15 min away. Outlet & Antique shopping, Winery Tours, Casinos and White water rafting close by. Country Junction "Worlds Largest Country Store" is a must see on Rt 209. Hiking trails in nearby Hickory Run & Beltsville State Parks. Beltsville also has large lake for motorboats, jet skis, & kayaks with sandy beach, picnic tables and restrooms. 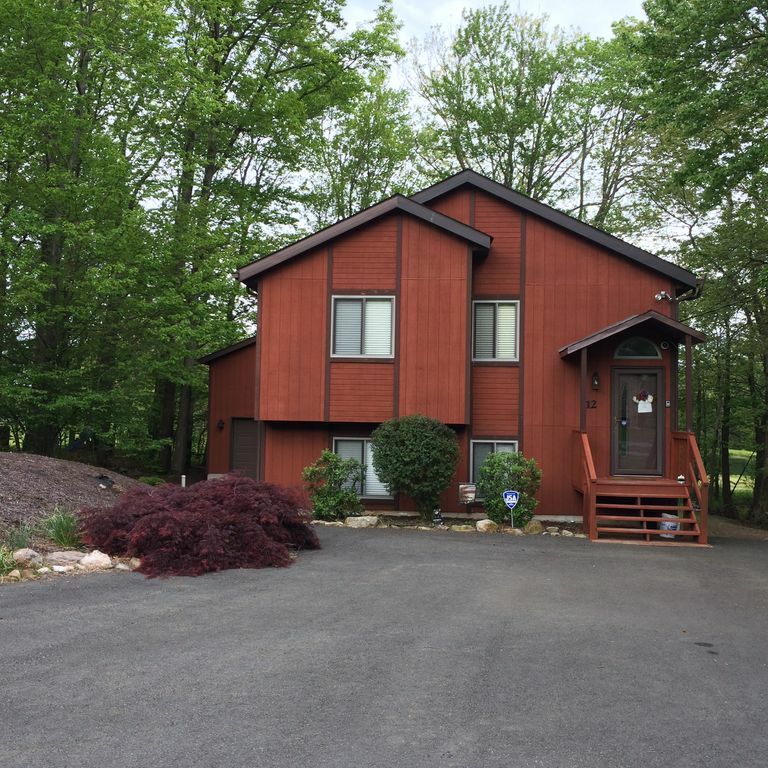 There is also Fishing, Hiking, Golf, Biking, Cinemas, Gambling, Swimming, Boating, CamelBeach, Amusement parks, Mahoning Valley Raceway, Pocono Int'l Raceway, Basketball, Miniature Golf, Fall Foliage, Birdwatching or just relaxing by the lake or by the warm fireplace. Ski: Just minutes away from Down hill Skiing at Jack Frost/ Big Boulder, Camelback, Blue Mt and cross country skiing also available nearby. Train: Jim Thorpe has 4 season train rides. Check out the Christmas and Fall Foliage rides. Weekends start at $695. This Lakefront property starts as low as $695.00 for a weekend!